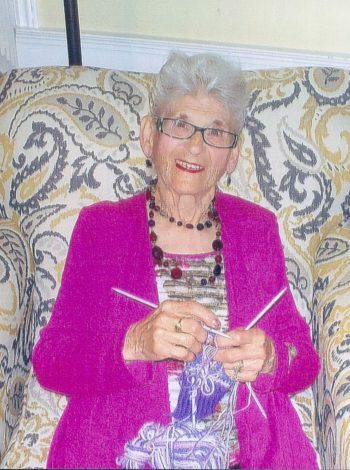 Passed peacefully away on September 16, 2017 at the age of 92, Pearl Samson of Cowards Island, Bonavista Bay. Predeceased by parents George and Elsie Morgan, her husband Andrew Samson; brothers Douglas and Max; sister Margaret Moss and daughter Kay Samson, son-in-law Claude Neil. Leaving to mourn her children Cavell Neil of Goulds, Tony Samson (Betty) of Dartmouth, NS and Dale Samson (Gary) of Eastport; sister Dorothy Temush of Ontario; 6 grandchildren Scott Neil (Debbie), Penny Power (Craig), Kim Samson, Tony Samson, Adrian Samson (Michelle) and Nicole Bonia (Joe); also 6 great-grandchildren; many nieces, nephews, cousins and friends. She will be resting at Carnell’s Funeral Home, 329 Freshwater Road on Tuesday, September 19 from 10 a.m. – 12 noon, 2-4 & 7-9 p.m. Funeral service will take place at St. Paul’s Church, Goulds on Wednesday, September 20 at 11 a.m. with interment to follow at Anglican Cemetery, Kenmount Road. Flowers gratefully accepted or donations to the Salvation Army. It was so nice to meet such a lovely lady. It was a pleasure to have met you. You will always remain in my heart. You will be missed. Love Barabara Vidito. Cavell, so sorry to hear of your mom’s passing. Please accept and pass on to all your family our sincere condolences. So sorry to hear of Pearl’s passing. We have so many wonderful memories of the time spent at Mom’s cabin and lots of trout stories to remember. her by. She was a wonderful person and so much fun to be around.. Our thoughts and prayers are with you all during this difficult time. Tony, Betty and family, so sorry to hear of your moms passing. My deepest condolences from both me and my Family. Mrs. Samson was a very special lady in my life, my ex-Mother-in-law, my Daughter’s loving Grandmother and a truly Dear Friend who always treated me like a son. I have such beautiful memories of our many fishing and hunting adventures in Indian Bay , our many games of 120’s at the cabin and her sharp wit and humour. Mrs. Samson will always own a piece of my heart and I will always treasure having her in my life. Please accept my deepest condolences to the entire family. Love Always, Mrs. Samson – I will miss you always. My deepest condolences to the rest of the family. Nan was the embodiment of strength and determination. I have very fond memories of her kindness and am grateful to have had her around for so many years. She was happy to be out picking berries in the country and always made sure everyone was well fed. Rest well Nan. Love you very much. My deepest condolences to you all, my family. It is a loss that is monumental. She will be forever in our hearts. Although we can’t be with you , in spirit we are with you. We all loved Nan so much, our biggest cheerleader.